Poor Japanese data and solid performance of worldwide equities underpinned the pair. Rally stalled amid decreased demand for the greenback in a risk-favorable environment. 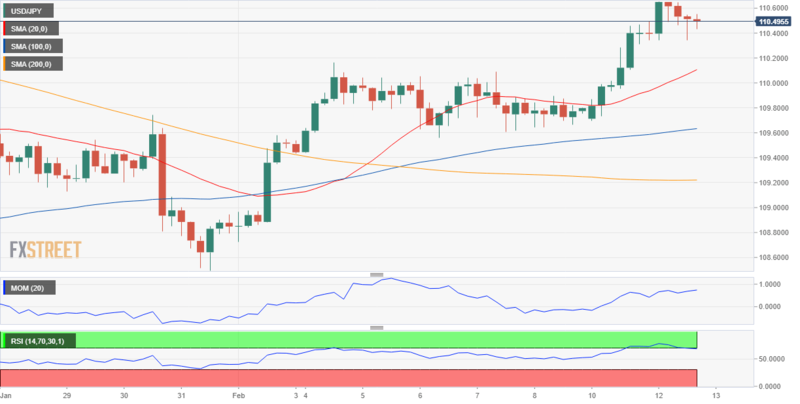 The USD/JPY pair settled near a fresh 2019 high of 110.65 achieved during the Asian session, having spent the US session consolidating below the mentioned level, as opposed to broad dollar's weakness, equities were sharply up on the back of encouraging political-related news. The yen was also hurt by local data, as the January preliminary estimate of January Machine Tool Orders fell by 18.8% YoY, following 18.3% decline in December, while the monthly Tertiary Industry Index was down by 0.3%. Investors were not impressed by the BOJ decision to buy ¥180B of 10- to 25-year JGBs, down from ¥200B last week a movement that could have been considered a hint toward reducing their stimulus, if it wasn't by Governor Kuroda clarifying multiple times that is part of their monetary policy, aimed to maintain the yield curve under control. During the upcoming Asian session, Japan will release January Domestic Corporate Goods Price Index figures, foreseen 0.2% lower MoM and up by 1.1% YoY. The pair is currently hovering around the 110.45 price zone, a relevant static level as it topped around it multiple times in the last couple of months. In the 4 hours chart, the price is firmly above its 100 and 200 SMA, with the shorter above the larger one although both lacking directional strength, while the Momentum indicator turned horizontal in bullish ground and the RSI corrected overbought conditions, heading lower at around 66, not enough to suggest further slides ahead. Further gains beyond the mentioned daily high should anticipate a recovery up to 111.44, December 26 high.